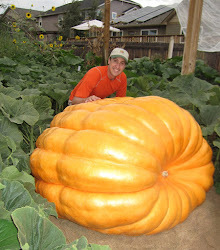 If you want to see some big pumpkins and spend some time with some great people, come to the Rocky Mountain Giant Vegetable Growers patch tour tomorrow. On the patch tour you go to a number of growers pumpkin patches to see what they have going on, eat a lot of good food and talk everything pumpkins. Next to the weigh-offs it is my second favorite thing that the club does each year. The tour is coming by my patch this year. I suspect I'll have the prettiest pumpkin on the tour this year but nothing truly big like I had last season. This evening I did a foliar application of liquid seaweed with humic acid.